Bankruptcy asset sales of chemical machinery. Make your bid! 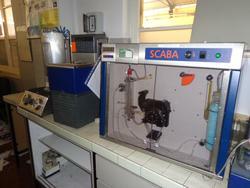 Industrial Discount offers you the best of used chemical machinery. Attending an auction on our website is a great opportunity to win high-quality tools and machinery for chemical, pharmaceutical and cosmetic industries, at the best prices. Make the most money in the market for used chemical machinery: you can easily start or increase your business with a small investment. You can choose between a wide range of chemical machinery, sold in bankruptcy procedures. We manage every stage of the sales with the greatest accuracy, providing the best transparency and security. Attending an auction is easy and cost-effective: all you have to do is register for free, find the item that suits your needs and make your bid. On each auction page you will find all the information you need to make your choice: full description, technical specifications and sale documents that you can review at any time. If you need it, you can ask for an inspection of the item before making your offer: all you have to do is contacting the contact person whose details are provided on the auction page. If you have any questions on the functioning of our auctions, you can chat with us in real-time through the quick chat service on our website. Register now to buy the best chemical machinery at the best price!